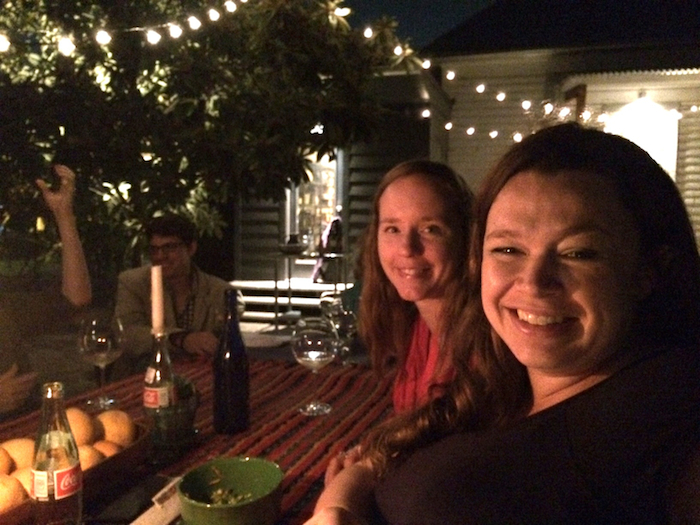 We had recently landscaped our house, Bekah was seven months pregnant, and she was soon going to say goodbye to her twenties. We decided to celebrate. 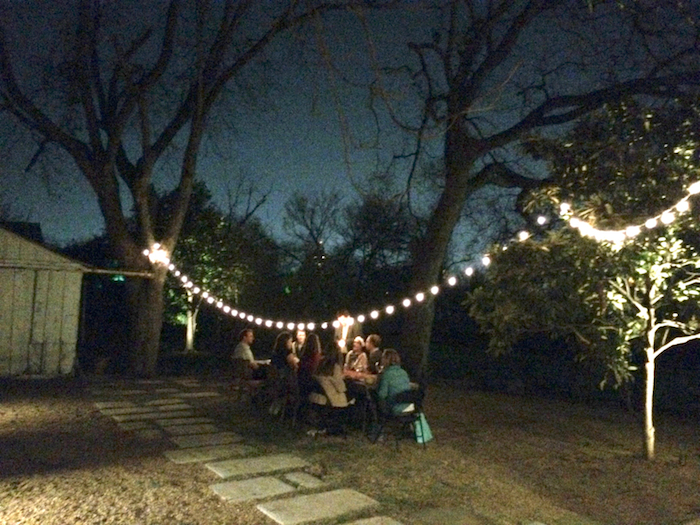 It was a usual balmy January night in San Antonio. We lit a fire anyway because we really wanted to try out our new fire pit. 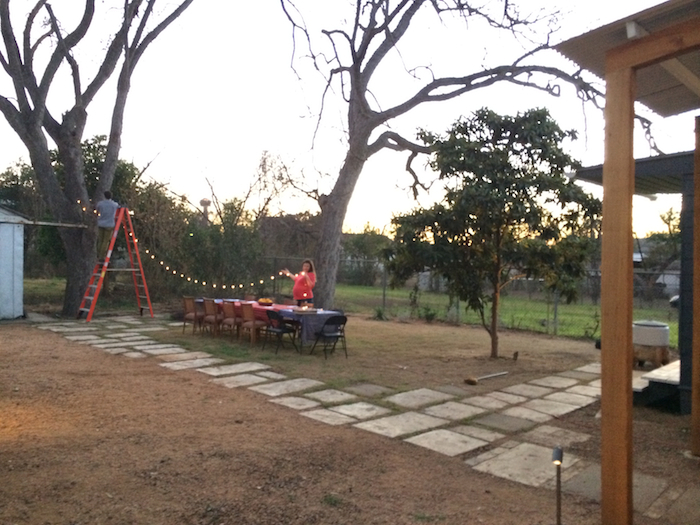 We dragged all the dining room furniture into the back yard. Houses with peeling paint surrounded us on all sides. 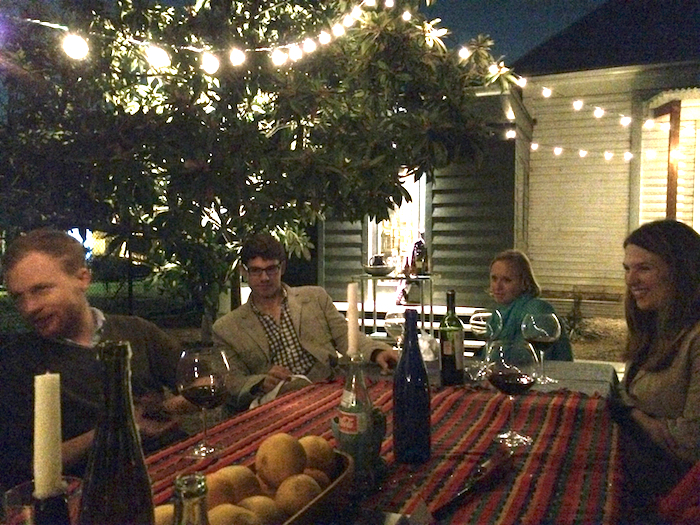 Some of our oldest friends (as many as we could fit at the table) gathered at dusk. 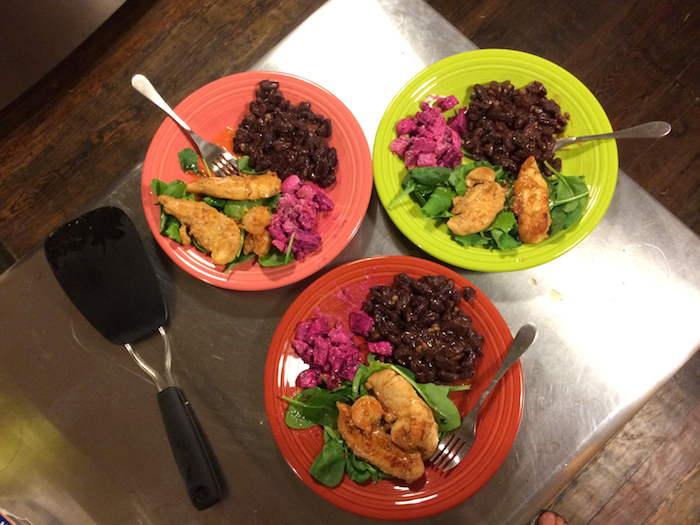 Sweet Yams (world’s best organic soul food shack that also happens to be in our neighborhood) catered the dinner. 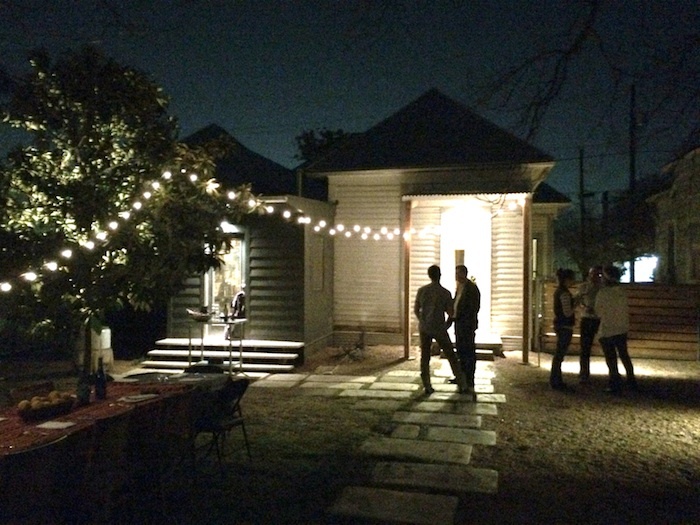 White wine, Mexican Coke and Alamo Beer (our neighbor three blocks away) flowed freely. (We love our neighborhood.) The gregarious Rottweilers fretted and muttered things under their breaths from their exile in the laundry room. It does not have to take much to imbue a crusty old place with honest atmosphere suitable for the sacred act of celebration. Nighttime helps. So does prayer. So does scooping all the dog poop out of the yard ahead of time. There are unlimited things you can do when you decide to make something happen. The art of it all comes from figuring out what few basic things you actually have to do, and then attack them with deliberate focus. 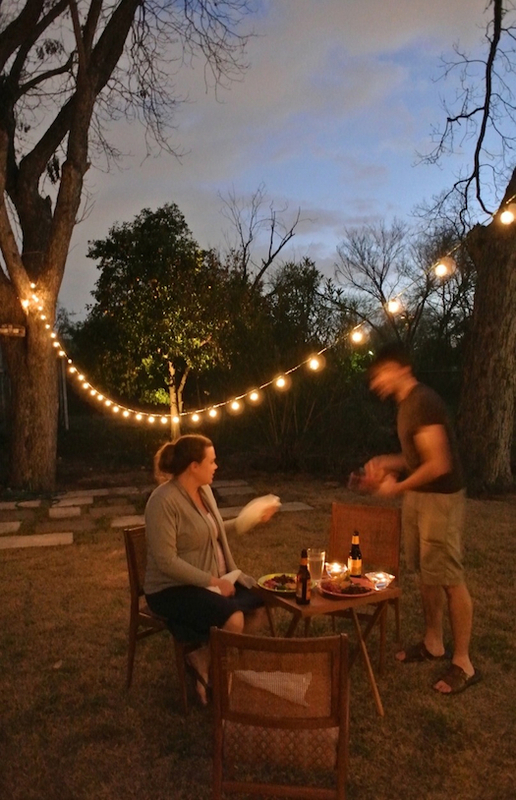 We hung some string lights and lit some candles and didn’t really attempt much else for our first back yard soiree. We were under no delusions that what we were making here was going to be around for a thousand years, or was going to be in some way perfect. At best what we were trying to do with this celebration (and what we always want to try for) was to make something like an exploratory sketch of a world that is different than the one we live in now. We want to make guesses about what a redeemed world might actually look like. Meanwhile before Jesus comes back to make all things new and before that other world actually arrives, we currently have limited time and limited funds. The stuff we have to work with is all in some state of falling apart. The immediate goal here is to use old imperfect things to make some compelling new thing in the simplest and most honest way possible. Designing anything honestly, whether it’s a dinner party or a building, is about knowing when you’ve achieved the essential goal, and then stopping. This usually means there won’t be a lot of extra fluff to throw away when it’s over. It also means you might have crafted something that somehow feels more finely honed for its moment, more jewel-like, and more evocative of your deepest desires. 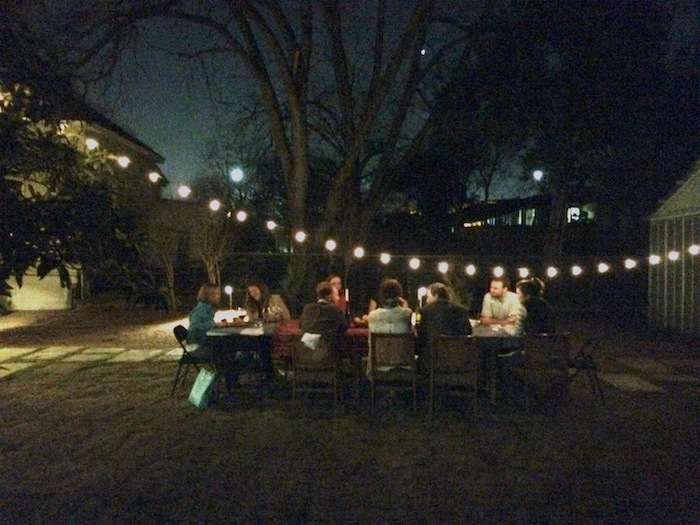 The next night we ate leftovers and tried out our back yard party setup in a quieter mode and at a smaller scale. We found that it still worked.